Chinese telecom equipment maker Huawei has been releasing its phones regularly over the last few years. But in India, its sub-brand Honor is more renowned as it has completed close to three years here. The only Huawei-branded phone that was launched in India was the Huawei P9 which was announced in 2016. Since then, even though Huawei has been releasing its Mate series devices in the European and Chinese markets, India has not seen the release of those phones. With the P20 series, that is set to change. The P20 Pro is the latest flagship from Huawei and it is one of the first smartphones in the world to come with a triple rear camera setup. 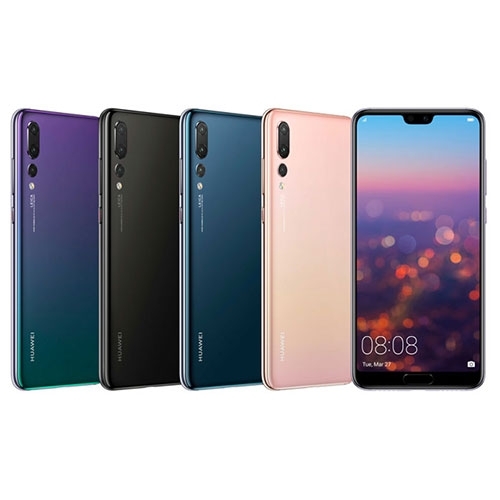 While we will be getting into the nitty-gritty of the smartphone in the review below, one thing is for certain: Huawei is looking to destroy the flagship duopoly created by Apple and Samsung, and it has a damn good competitor in the form of the P20 Pro to respond to the Samsung Galaxy S9+ as well as the Apple iPhone X. Unlike the Google Pixel 2 XL which vowed us with its camera chops, the Huawei P20 Pro provides a complete package (and a much gorgeous design) that gives it an edge over the Pixel 2 XL. So to that effect, yes, the Huawei P20 Pro is the new flagship phone to look out for. With that out of the way, let’s do a deep dive into how the Huawei P20 Pro fares. From the first time I saw the leaks of the Huawei P20 Pro, I could not wait to hold the phone in my hands. Over the years, we have seen Android devices ape the iPhone, but at the same time, there are some exceptions where they do a fabulous job with the design. Samsung has been doing that consistently with its wonderfully designed Galaxy S and Note series, Xiaomi impressed us with the Mi Mix series, LG and HTC although not that popular anymore, still manage to release good looking devices. 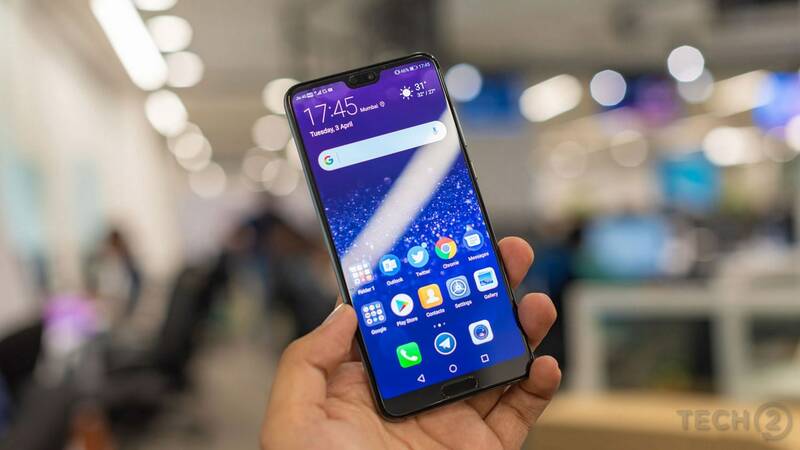 Huawei has been doing that in the China and European markets with its P and Mate series devices, but with the P20 Pro, it has taken things ‘up a notch’. Make of that what you will. 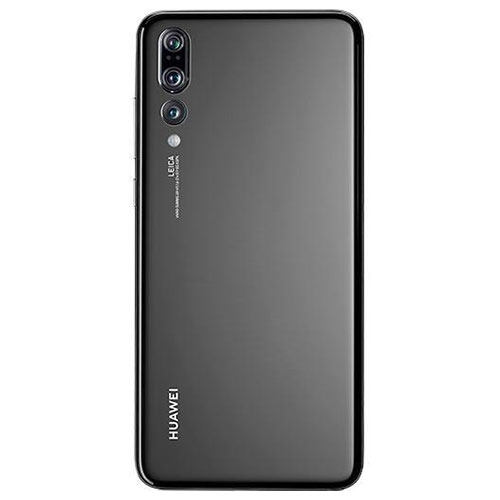 The design is a departure from the Mate series design that Huawei has been bringing to its flagship phones over the years. The Huawei P20 Pro looks, in a word, gorgeous. Huawei has gone with a glass and metal design aesthetic and you see that in shimmering gloss around the device. The rear side is what gets your attention and it comes with a glass back with 2.5D curved glass which aligns perfectly with the metal edge. There is no sharp edge which demarcates where the glass back meets the metal edge. However, despite the glass back, the Huawei P20 Pro does not support wireless charging. While the glass back is highly glossy, almost acting like a mirror in case you want to check yourself out, it also happens to be a smudge and fingerprint magnet. So you will have to constantly keep cleaning it. The monotony of the glossy blue glass back is broken towards the left-hand corner. On the top you have the triple camera module, along with the quad LED flash unit. Lower down you have the Leica and Huawei branding which are nicely aligned. The three cameras are divided into a dual camera module (40 MP + 8 MP) and a 20 MP monochrome module. Both these modules protrude out, with the dual camera module doing that more conspicuously. As a result, when you place the phone on its back, it will rest at an angle. Snapping on a cover can resolve the issue, but with this device, you would want to show off that glossy back. The phone isn’t too slippery which is a good thing. Coming to the edges, you have a nicely rounded edge, which assists with the grip. On the left-hand side, you have the dual nano-SIM card slot and on the right-hand side, there is the volume rocker button and the power/standby button which has a red-coloured depression on it. Both these buttons are well built and have good tactility. On the base, you have the USB Type C data transfer and power connector port surrounded by speaker grilles. On the top, you have the microphone and an infrared port to control supported electrical appliances. You will find antenna cut-outs on the top and the bottom edge. Am I missing out on something? Yes, the 3.5 mm audio jack — well, it’s not there on the P20 Pro. Huawei has bundled in an adapter cable in the box in case you are still using regular headphones. 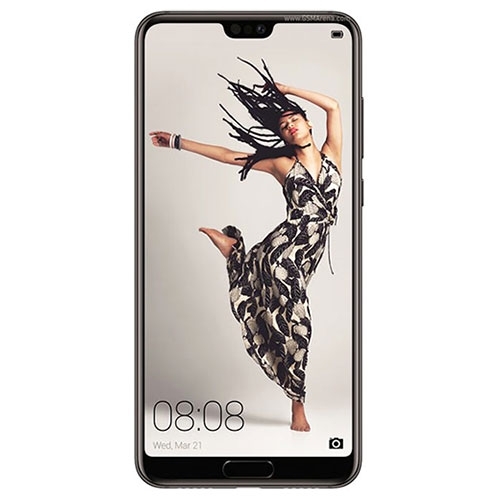 On the front face of the Huawei P20 Pro, you have a 6.1-inch AMOLED display with a visible notch on top that houses the round earpiece speaker (which also functions as a loudspeaker) and the front-facing camera. It is a thinner notch as compared to the Apple iPhone X, and there is a provision to get rid of it in the settings menu. 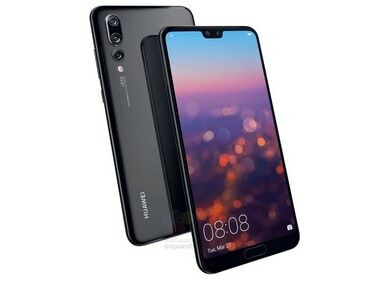 While it is a tall display, Huawei has decided to keep a thick bottom bezel to house the rectangular fingerprint scanner. The Huawei P20 Pro has a sturdy build and it also comes with an IP67 dust and water resistance. In the time that I used it for the review, I did not notice any scratch on the metal edge or on the glass behind. But I did find myself constantly cleaning the rear side. Huawei branded phones have always been offering flagship features and it’s the second most selling brand in Europe. Last time we had seen a Huawei branded phone was when it launched the Huawei P9 in 2016. This was one of the first phone which Huawei had released with the Leica branding. It has remained a tradition since then. 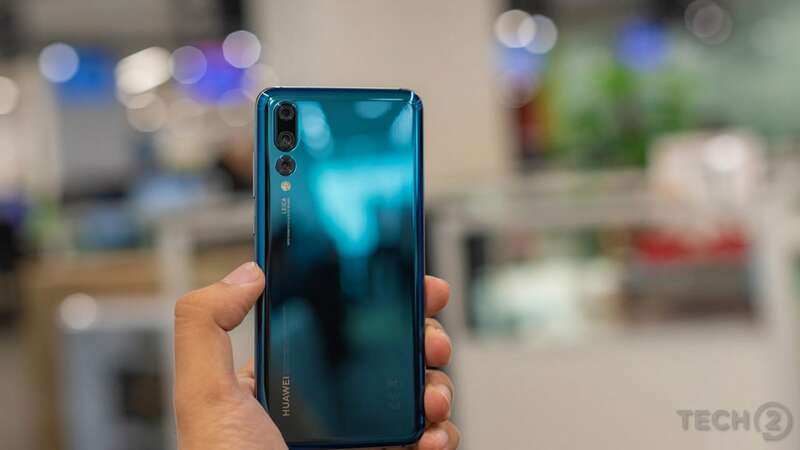 And with the P20 Pro, Huawei has for the first time released a triple camera sporting smartphone. This also happens to be an industry first. So let’s first get the main feature out of the way. 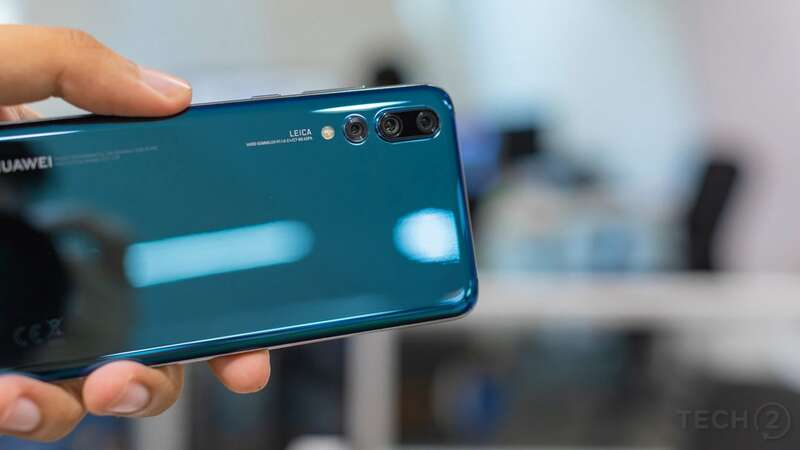 On the rear side, you get three cameras — a single 20 MP monochrome camera and a dual camera module which has a 40 MP camera and an 8 MP zoom camera. We will discuss the finer details of the sensors and apertures in the camera section. On the front, it has a 24 MP camera. On doing the math, you arrive at 92 MP worth of total camera resolution on a smartphone, which is unprecedented — by the way it does not mean you should expect 92 MP images. The maximum resolution images will be around 40 MP. The Huawei P20 Pro is powered by a HiSilicon Kirin 970 chipset which houses an octa-core processor with one quad-core Cortex A73 cluster clocked at 2.4 GHz and the other quad-core Cortex A53 cluster clocked at 1.8 GHz along with a Mali G72 MP12 GPU. This is paired with 6 GB RAM module and on the storage front, you a get 128 GB of non-expandable storage. 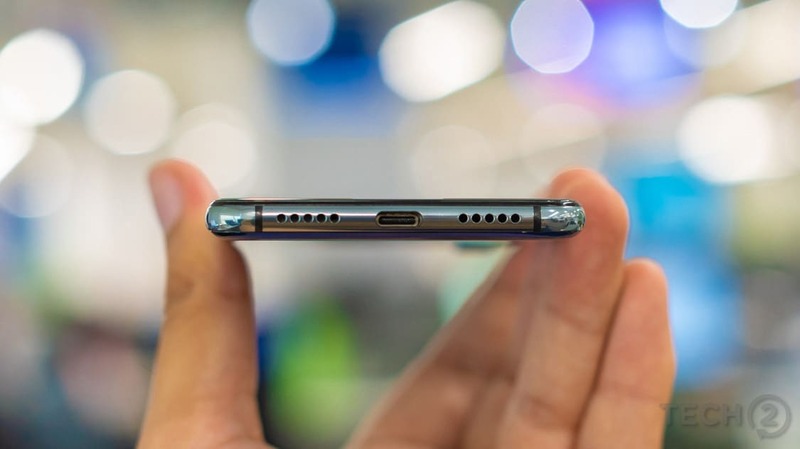 In what is soon becoming a trend among flagship phones (Samsung being an exception) the P20 Pro also ditches the 3.5 mm audio jack. It does, however, bundle an earphone with a USB Type C port. Thankfully stereo sound is present with the earpiece acting as the second speaker and it is plenty loud to enjoy a video in a quiet room. There’s support for Wi-Fi 802.11 ac, Bluetooth 4.2 with aptX HD support, GPS with A-GPS and GLONASS, NFC, Infrared port and no FM radio. A non-removable 4,000 mAh Li-Po battery completes the package and it comes with a support for fast charging. The Huawei P20 Pro comes with a 6.1-inch AMOLED display with an 18:9 aspect ratio. 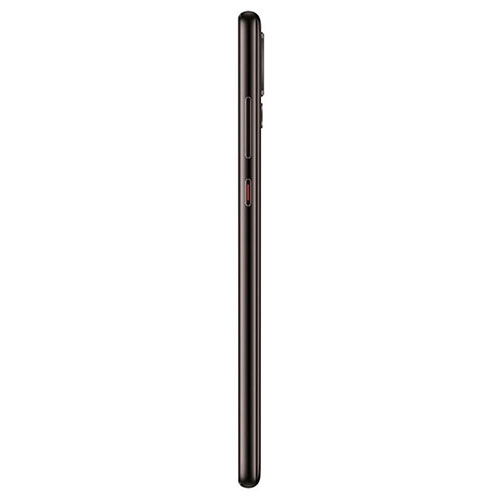 It has a resolution of 1080 x 2240 pixels which gives a pixel density of 408 PPI. The display covers a large portion of the front face, but Huawei has still left a chin at the bottom which houses the rectangular fingerprint scanner. Having said that, the top and side bezels are extremely thin, with a notch in the centre. 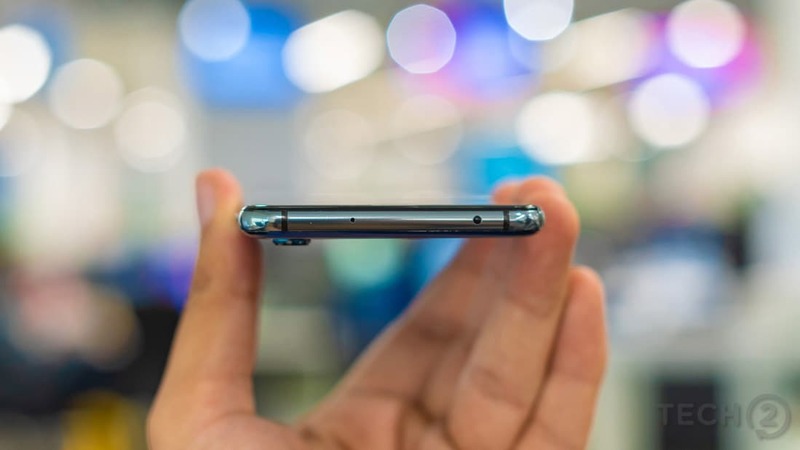 This notch is thinner than the one seen on the Apple iPhone X, but then again it also houses only the front-facing camera and the round earpiece speaker, which also functions as the second loudspeaker. It does not have the army of sensors that one sees on the iPhone X in its notch (which are needed for the Face ID). There is a screen to body ratio of 82 percent. The display is sharp and the colours are great. It does not veer towards a very vivid colour profile by default, although you can get that activated from the settings if you so prefer. 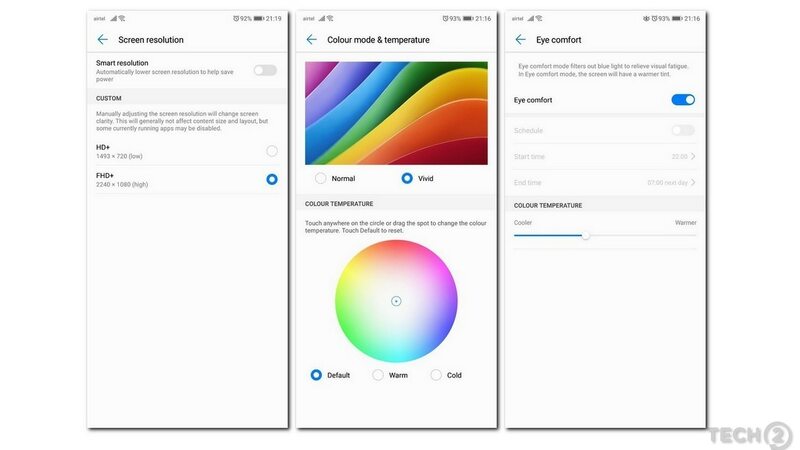 You can set the Eye comfort mode to get activated at a certain time at night, this is to reduce the blue light emanating from the phone to relieve visual fatigue. There’s also a Natural Tone feature which will adjust the colour temperature based on the ambient lighting conditions. You also get the opportunity to automatically reduce the resolution of the display to save power. The display is really good and I did not face any issues while lengthy reading sessions as well as while gaming and binge-watching sessions of Netflix. The auto-brightness mode transitions nicely when you from a dark area to a well-lit area. Sunlight legibility is great. The notch really does not affect your viewing experience, as you get used to it after a couple of days. Don’t like the notch design? Well, there’s an option in the settings mode which lets you get rid of that as well. On the whole, this is one pleasant display. The P20 Pro comes with the latest and greatest in terms of operating systems from Huawei. You get Android 8.1 Oreo out of the box which is skinned with Huawei’s proprietary skin, the Emotion UI 8.1 also known as EMUI 8.1. Huawei has decided to change the naming convention of the skin in order for it to be mimicking the Android OS version number, which makes a lot of sense. It comes with the 1 March 2018 security patch. The first impressive part is that you can switch from the default home-pages-only layout to the one with an app drawer. This is a thoughtful addition. The response of the user interface is smooth on most occasions. Yes, there were a couple of animations freezes and slow switching between apps every once in a while. The bloatware on P20 Pro comes in the form of a lot of custom apps such as Wallet, Weather, HiCare, Mirror, App Gallery, Backup and more. Thankfully, you can uninstall some of them. It also comes preinstalled with Instagram, eBay, Booking and so on. Digging deeper into settings, you will come across a host of interesting features. There are a lot of things to wrap your head around, and although the EMUI has neatly divided things into sections, I found myself using the search bar in the Settings menu to quickly get to what I wanted to adjust. You keep getting prompted with suggestions, which you can choose to ignore by clicking on the ‘x’ button beside them. 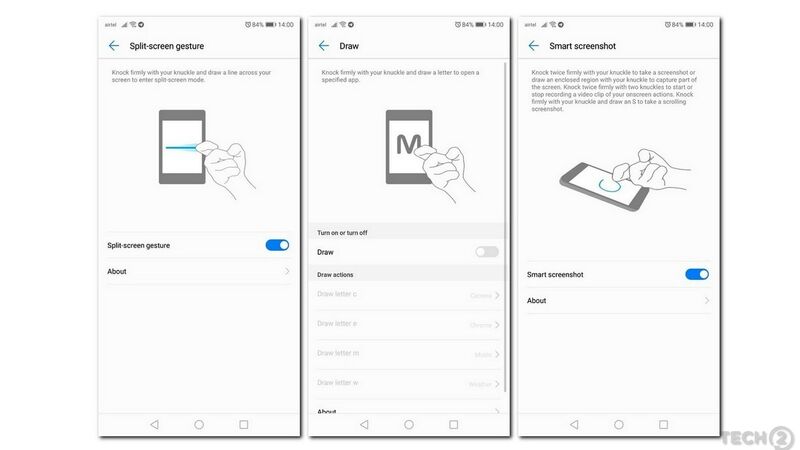 Navigation can be done using either the onscreen navigation buttons, a navigation dock, offscreen (using fingerprint sensor) and onscreen navigation. The Smart Assistance section offers a lot of features to make using the phone a breeze. 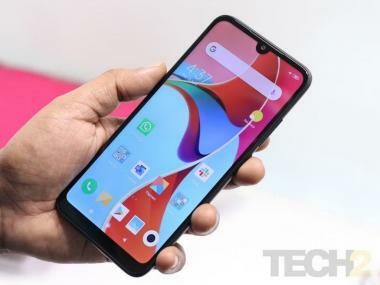 You get a Flip to mute option, double knock on the display to take a screenshot which is interesting, one-handed UI mode which can give you a mini-screen view, drawing letters on the phone to open apps, double touch to wake up the phone display, knocking and dragging your knuckle across the display to activate split screen motion, among other cool assistance features. There’s a feature to use voice control to activate quick calling, answering calls and more. There’s even a glove mode, which I don’t think I will be using ever in Mumbai. 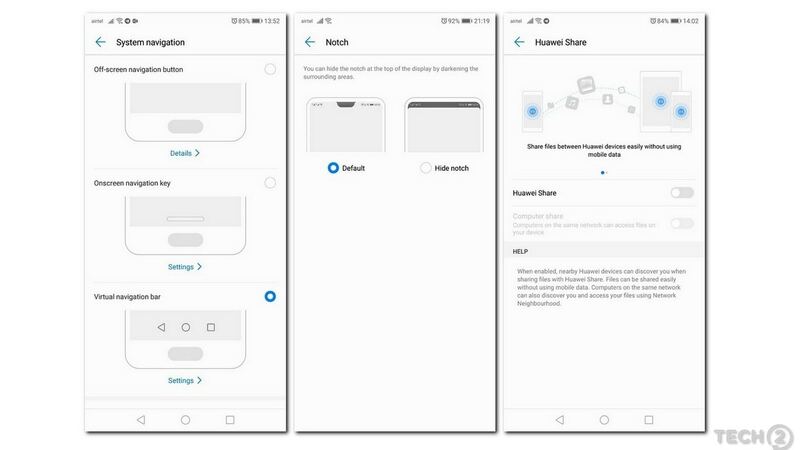 Huawei Share is a feature that creates an ad-hoc network to quickly share files between your phone and other devices. Easy Projection lets you connect your phone to any display using a USB Type C to HDMI, VGA or DVI cable. These two features are relevant for business users. Even with the fingerprint sensor, you can allow more functions over and above just using it to unlock the phone. For instance, you can lock apps using your fingerprint. Face Unlock, though not the most secure, can be used to directly unlock the device or do that with a slide to unlock option. I did not find the Face Unlock feature to be the that quick, and after a point, I just started using the fingerprint to unlock. I liked the fact that the Battery section, among other things, also offers a Darken Interface feature, which gives you an all-black theme. Overall, the EMUI 8.1 is quite feature-rich and offers plenty of ways to customise the way your phone looks. The only hope is that the skin keeps up with all the OS updates coming from the Android OS. We have come to expect a minimum performance benchmark from flagship devices, and very rarely does any device perform below par. The Huawei P20 Pro is no exception. The Kirin 970 chipset is a generation old now, and while it was at par with Qualcomm’s Snapdragon 835 SoC, it lags slightly behind the new gen Snapdragon 845 and the Exynos 9810 as is observed from the readings. If you were to look at pure numbers, the Apple’s A11 Bionic chipset leaves it behind in benchmarks such as Geekbench. 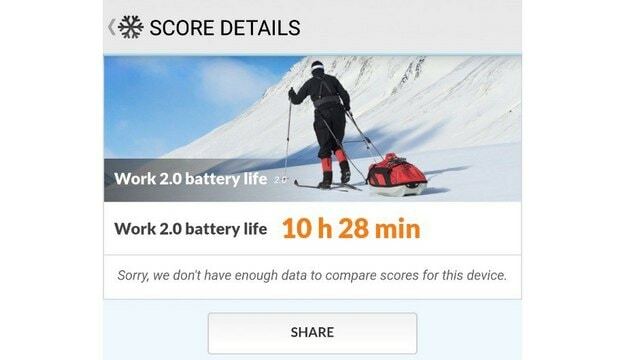 But benchmark numbers are just an indicative factor, the real test of the phone is in real life use case scenarios. On that front, the Huawei P20 Pro delivers. The phone is fast, the user interface is quite responsive and it’s great at multi-tasking without any noticeable slowdown in the device. The earpiece speaker is loud and clear and the caller at the opposite end is clearly audible. The stereo speakers are also helpful if you just want to watch a quick video or two as the speakers are sufficiently loud. Pair that with the great display ont he P20 Pro and your media consumption is sorted on this device. When it comes to gaming, the Kirin 970 along with the Mali G72 GPU ensures that there are no hitches there. Asphalt 8: Airborne and Modern Combat 5 ran without any hiccups on the maximum resolution as well. The fingerprint scanner on the P20 Pro is quick, but the Face Unlock is quite slow even when there is sufficient lighting around. Water and dust resistance are handy features as well. This is easily the most important feature on the Huawei P20 Pro, after all, how many smartphones have you seen with a triple rear camera setup? As mentioned earlier, you have a 20 MP monochrome camera, a 40 MP RGB camera and an 8 MP camera which provides the 3x optical zoom support. On the front, you have a 24 MP camera. Now, while the 40 MP sensor comes with a f/1.8 aperture and the 20 MP monochrome sensor comes with a f/1.6 aperture, the telephoto lens in front of the 8 MP camera comes with a f/2.4 aperture. All the optics on the rear camera are powered by Leica. On the front camera, you get a f/2.0 aperture. So there are many cameras, but what exactly do they do? Well, the 40 MP RGB sensor is the main camera and is tasked with capturing colours, the 8 MP camera provides the optical zoom and additional focal length and the 20 MP camera, being a monochrome camera, captures a lot of detail, which assists with improving the sharpness of the overall image. The 40 MP camera on the Huawei P20 Pro has the largest sensor size at 1/1.7-inch, which is much higher than the 1/2.9-inch sensor seen on the iPhone X and the 1/2.55-inch seen on the Galaxy S9+. Not just that, the 40 MP sensor on the Huawei P20 Pro’s main camera uses a process called pixel-binning (Huawei calls this Pixel Fusion) to capture light information from four 1 micron pixels and combine them into a 2x2 grid. So essentially, it’s taking four red pixels and combining it to form one big red pixel and the same process for the green and blue pixels as well. By default, the camera resolution then comes to around 10 MP, but it manages to capture a lot of colour information than say a single pixel on its own would be able to. The 10 MP camera mode also lets you capture images at 3x optical zoom and 5x hybrid zoom. Now when you are capturing an image, all three cameras work together to create the final image. In fact, the monochrome camera sensor captures three times more light information than the RGB sensor as it has no colour filters to deal with, which enables detailed shots in low light situations and less noisy shadow regions. The Huawei P20 Pro supports 3x optical zoom, 5x hybrid zoom, 4D predictive focus, 960 fps slow motion video recording mode and supports a maximum ISO of 102,400. Note: Please head over to our Huawei P20 Pro photo album on Flickr to view the photos shot in full resolution. Coming to the image quality, it’s a mixed bag with a lot of good bits and few issues. 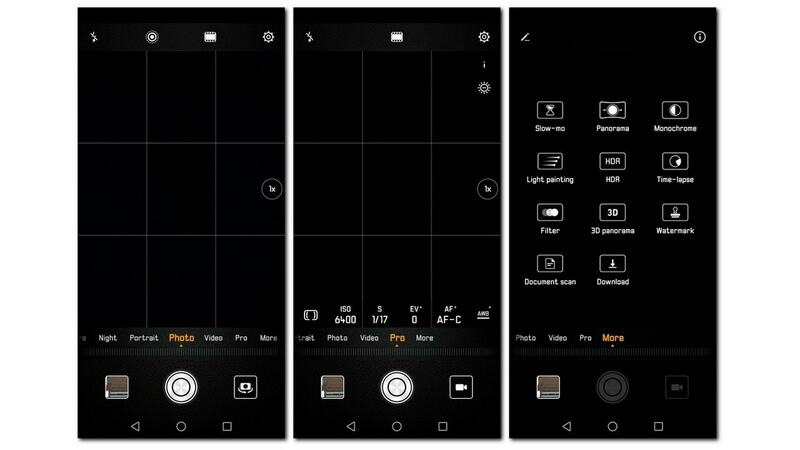 For starters, the 10 MP camera mode is what you will be clicking most of your images in, as it gives you a lot more detail, gives the options to activate optical and hybrid zooms and keeps noise in check. The focusing during daylight and even during low light situations was generally quick. Huawei has combined laser AF with contrast detect and phase detect AF to ensure the focusing is generally on point. Go for the 40 MP resolution only if there is sufficient light and you know you will not be using the 3x and 5x zooms. It does have the provision to let you shoot in the RAW mode as well. Images coming out of the camera are generally good but in most cases on zooming 100 percent I did notice a loss of detail. There is definite over-sharpening. For instance is a crowded street, the details on the face area are too waxy, or when clicking a stone building will result in flat texture on the stones on pixel peeping. If you want to make large prints of phones (which one rarely does these days) you may notice some artifacts. But for social sharing and just viewing images on phones or tablets, it's not much of an issue. Noise control is generally good. I was particularly impressed with the amount of detail that was captured even with the 5x hybrid zoom — granted it’s nowhere close to what a 5x true optical zoom camera would capture, but in a well-lit situation, it’s not completely useless either. Technically, you can go up to 10x digital zoom, but then you would be pushing things too far with that, as all details are lost at that level of digital zoom. 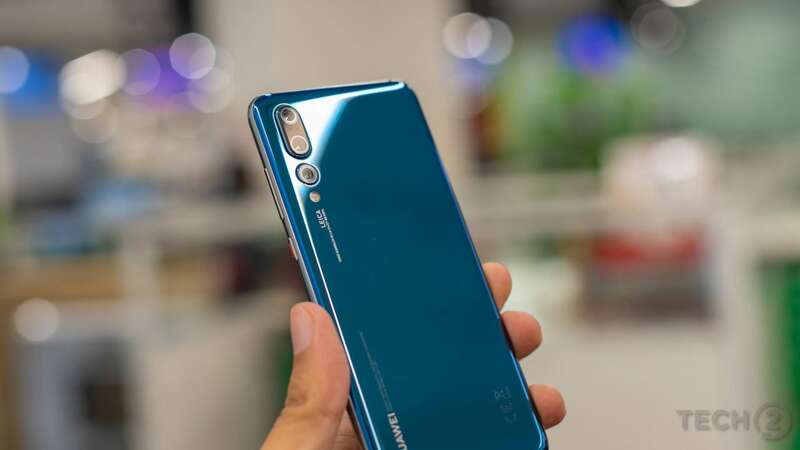 Thanks to the presence of the Kirin 970, which has the Neural Processing Engine, Huawei P20 Pro makes use of a lot of artificial intelligence and machine learning to assist with photography. 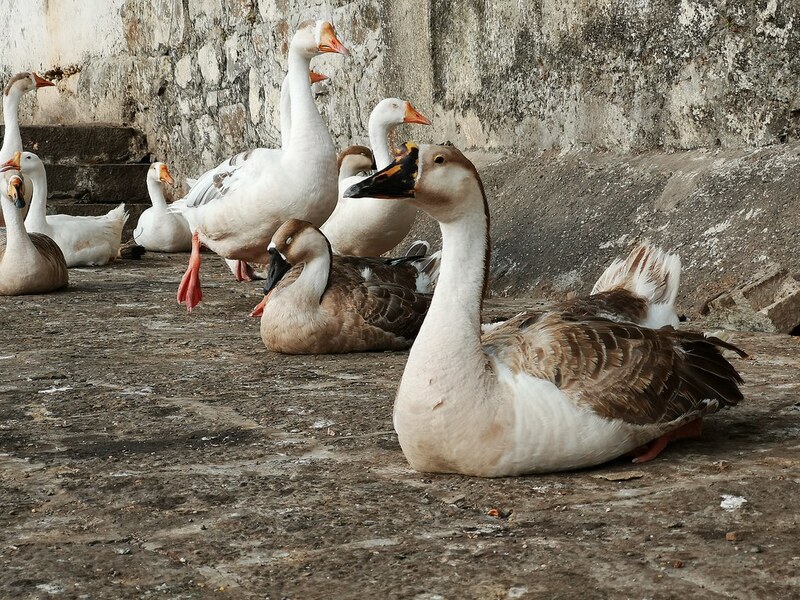 On a regular basis, it is intelligently able to identify a scene (there are 19 such scenes including blue sky, greenery, food, dog, cat, etc) and apply the necessary intelligent auto settings to give you what the Huawei AI thinks is a good image. 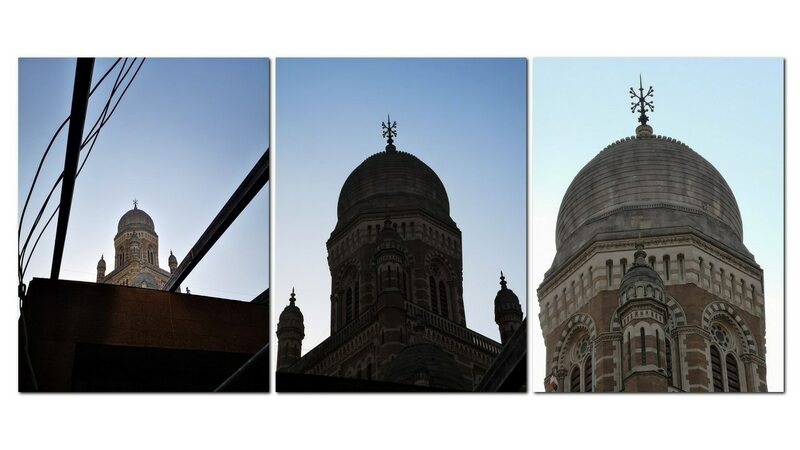 Now, this is a hit and miss on most times — for instance when I was shooting the BMC building in CST against the blue sky, the AI made the sky appear an unnatural colour of vivid blue which wasn’t to my liking. But hey, a lot of Instagram filters do make colours pop out in the same way. And if your camera software is doing that in-camera itself, it may appeal to a lot of that kind of audience who love filters on their photos. In some instances such as shooting a plate of Pomfret in a not-so-well-lit restaurant, I found the Food mode applying the right colour enhancements to make the food on my plate look appetising, quite helpful. So this is a game you will be playing and you can disable the settings applied by the AI if you so wish. The default Photo mode isn’t that impressive after the sun has set, but switch to Night mode and you will be blown away. I have tested many smartphone cameras, and the majority of them which offer a Night mode, also come with a caveat — use a tripod to get the best details. When I first tried out the Night mode, it was around 7.15 PM and I was shooting this building in front of me which had a stationary biker on his phone. On hitting the shutter the camera started a countdown and on the display, I saw the camera making multiple images over 4-5 seconds — you know the drill, taking multiple images at multiple exposures and then combining to get the final photo after a few seconds of image processing. I obviously did breathe and was dead sure I may have captured some handshake motion which would ruin the final photograph. I honestly didn’t have much hope. And after the image was processed, I was mighty impressed with how the AI had compensated from my handshake and managed to give me an image with a high dynamic range. This is possible thanks to the AI enabled image stabilisation. It became my go-to mode to click low light photographs. The iPhone X or Galaxy S9+ has nothing close to this. Of course, on 100 percent viewing, the image does look like a painting. But I’d rather have that than one which is noise-ridden without even zooming in a 100 percent. It boils down to personal preference after a point. I did like the amount of detail present on the Pixel 2 XL and the Samsung Galaxy S9+ on pixel peeping. But when it comes to low light photography, I would choose the Night mode of the P20 Pro over the other two. Unlike the Apple iPhone X, the Huawei P20 Pro’s camera section has a definite learning curve as there is just lots to do once you are in the camera module — Pro mode, monochrome mode, slow-motion video recording, document scan, aperture priority mode, portrait mode, filters and much more. Coming to selfies, the 24 MP front-facing camera offered decent photos although I wouldn’t call them the best. On most occasions I found the images to be a bit too soft for my liking and the software-driven portrait mode wasn’t as good with feathering out the background from my face. It was a bit rough around the edges, which can be fixed in future software updates. The beauty mode which tends to unnaturally smoothen the face is something I abhor, but then I guess there is a huge audience for it. The Pixel 2/2 XL still manage to get brilliant photos in the portrait mode. In the video mode, I wasn’t as impressed. Sure, the P20 Pro lets you shoot in 4K at 30 fps along with 1080p at 60 fps and 30 fps among others. Barring the 1080p at 30 fps, getting stable video footage is a struggle. When shooting while walking, I noticed that there was a lot of camera shake. While panning too you tend to see a slight bit of shutter rolling. The only good footage I got out of the P20 Pro was when I was standing still in one place and shooting. But that’s the kind of footage that looks too stale and with something as portable as a smartphone, you want to document on video while you are moving. When it comes to video cameras on a smartphone, the Apple iPhone X is still the phone to beat. There is the 960 fps slow motion mode as well which shoots at 720 p just like the Samsung Galaxy S9+, but getting that right moment is a bit of work. Also, you need to have sufficient light to get the best out of the 960 fps slow motion mode. Overall, the video camera on the Huawei P20 Pro has a lot of scope for improvement. I will be doing a detailed comparison of the cameras on the P20 Pro against the Galaxy S9+, iPhone X and other flagships. So that should help answer some of your questions on that front. Huawei P20 Pro comes with a 4,000 mAh battery which easily lasted me a little over a day and a half worth of usage time. It is good to see a 4,000 mAh battery on flagship phones as we are generally used to seeing somewhere between 3,000 to 3,500 mAh at the most. With two Google accounts on sync, a constantly buzzing Slack and Telegram messenger, shooting 25-50 photos per day along with some video, listening to podcasts on my commute, watching a few YouTube videos and so on comprise my regular day. And the phone would easily outlast a day with a screen-on time of well over 5 hours. The fast charger (which Huawei calls Super Charger) bundled with the phone really helps with quick charging. It took me around 80 minutes to go from 0 to 100 percent which is super impressive. This fast charging will not work with other companies’ chargers though. With a OnePlus dash charger, for instance, it took over two hours for the complete charge. Our PC Mark for Android test returned a time of 10 hours 28 mins, which is again quite impressive. The Huawei P20 Pro is one smartphone that offers a complete package in terms of beautiful design, long-lasting battery, good performance and impressive cameras. The latest operating system with some neat value additions on the EMUI 8.1 skin also help. It certainly seems to be set to break the Apple and Samsung duopoly, which the Google has tried to with its Pixel phones, but they’re more loved for their camera performance only. Huawei could not have asked for a better smartphone to relaunch with, in India. The goodwill it has garnered through its Honor sub-brand should surely help. 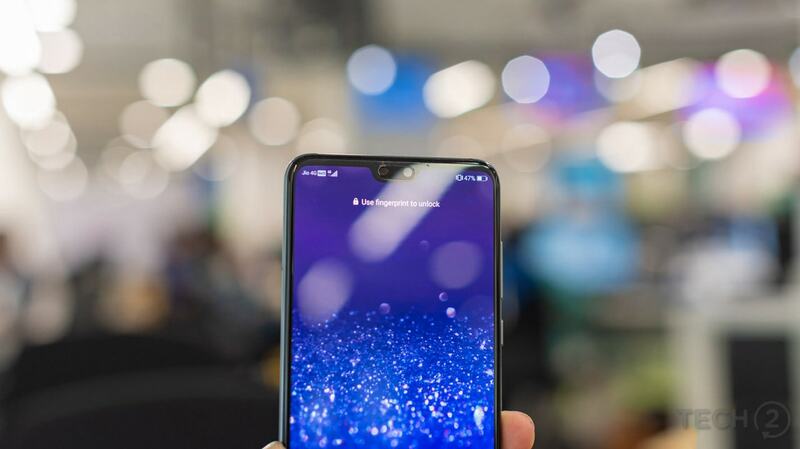 Yes, it will be difficult to break the sheer brand perception that an Apple and Samsung have cemented in the minds of buyers, but if Huawei is able to deliver on the after-sales service, it is one brand that surely stand on its own. At Rs 64,999, Huawei has priced the P20 Pro is priced almost the same as the Samsung Galaxy S9+ and slightly lower than the Google Pixel 2 XL (for the 128 GB storage). If you are not too hungover the Samsung branding, I would suggest you give the Huawei P20 Pro a try, at least it offers a much better battery life for starters. It is certainly a better deal over the Google Pixel 2 XL and the Apple iPhone X at its current selling price. 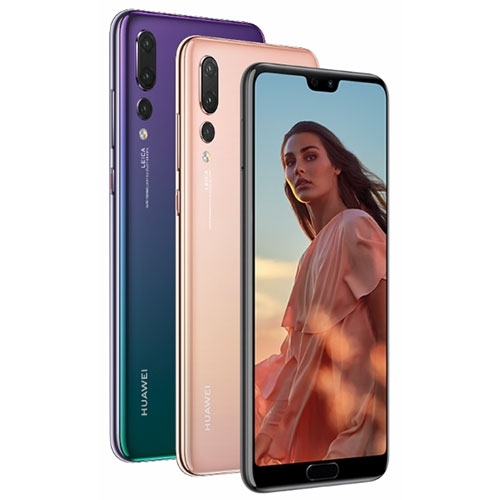 The Huawei P20 Pro features a 6.1-inch HD+ sAMOLED display with a resolution of 1080 x 2240 pixels and is powered by a 2.36GHz + 1.8GHz octa core processor and has 6GB of RAM. It comes with 128GB of inbuilt storage and has a 40.0 + 20.0 + 8.0-megapixel rear camera and 24.0-megapixel front camera. It comes with Android 8.1 Oreo OS and support a 4000mAh battery capacity with 3G & 4G.